Farley Lake is located in the Sawtooth Mountains near Stanley Idaho. It makes for a nice quick stop for the many hiking the Alice-Toxaway loop. But it’s also a great destination all on its own if you want to take a short hike to a scenic alpine lake. 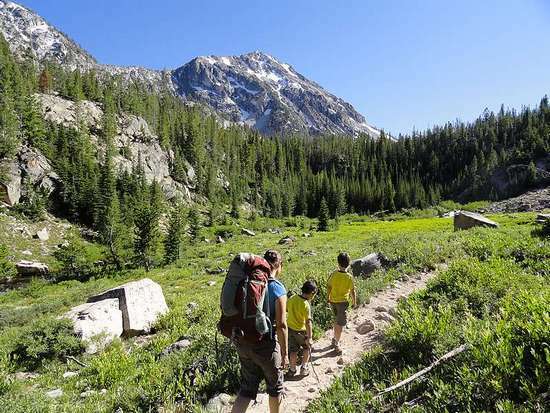 We chose it as our destination for a family backpacking trip. The drive from Boise to the Yellow Belly Lake trailhead took us just over 3.5 hours, with the last couple miles taking close to a half hour thanks to a very rough 4WD road. The well-marked trailhead is located near the southwest corner of Yellow Belly Lake. We started the much-anticipated hike at around 3pm, and after some “exploring” near the lake, we eventually spotted the right trail heading west. The trail winds its way through lodgepole forests and is pretty flat for the first mile and a half. Just before the trail started getting steeper, we reached the creek crossing. We couldn’t spot a log to cross, so I made multiple trips carrying the boys across. My wife decided to fend for herself. Didn’t trust me to carry her I guess… Then up the hill we went. My oldest son quizzed me every few minutes to see how much farther to the lake. Eventually we reached the base of a boulder field, some waterfalls, and a very scenic meadow not far below the lake. Once at the lake, we chose a great campsite on a small peninsula about half way along north side. It was very scenic, and only took us three hours to cover the three-mile hike. For dinner, I made pizzadillas, the boys favorite hiking food. Then we partook of much rock throwing while Mom retreated to the tent to escape the mosquitoes. Once the sun set, we hit the sack and slept with the rainfly off the tent so we could star gaze. Then next morning, we had granola pancakes for breakfast, broke camp, and headed back down the trail to the car. Hiking downhill was much more enjoyable than our prior day’s uphill hike, and Mom even found a log for us to cross the creek. Good times were had by all. Map of our route, about 6 miles and 700' gain round trip. Beautiful meadow, not far from the lake. Taking a break, waterfall in the background. Parks Peak reflecting in Farley Lake. About ready to turn in for the night. Heading back down the trail the next morning. Posing next to a waterfall next to the trail. Tree holding up a big rock?